#Reigate April 2015 weather summary: sunniest on record! 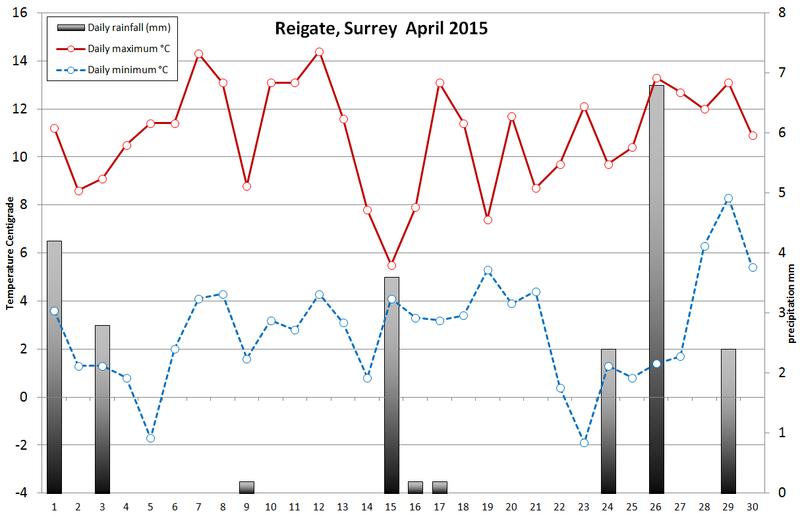 April in Reigate was a mostly dry, very sunny, rather calm and relatively warm month. However, the settled weather came at a price with a significant air pollution event on 10 April. Also, April showers were conspicuous by their almost complete absence so convective weather fans were left disappointed. April was 43% drier than average across SE England and this shows up in the diminutive 23mm of rain in Reigate. Pressure rose early in the month and so April turned out 150% sunnier and about 1C warmer than average too. The central England temperature for April came out at 1.1C above long term average. It was the SUNNIEST April on record for the UK according to the MetOffice. 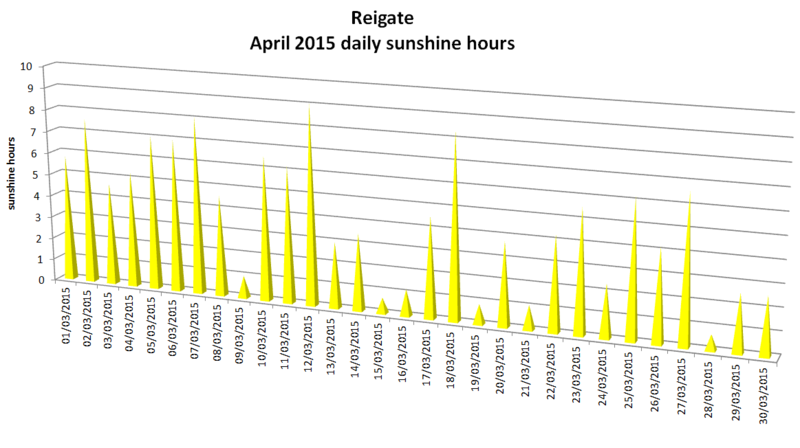 In Reigate we enjoyed 136 hours of sunshine in April. The significant downside of this calm weather was high AIR POLLUTION. There was a high pollution warning for a time when easterly / south easterly winds brought high levels of PM2 particles into the SE and across London from Benelux countries. Here are some photos from Reigate during April showing what a mostly very pleasant month it was. September was a warm and unusually dry month. Central England temperature (CET) came out officially as 15.1C which is 1.5C above the 30 year average (Hadcet) and made September the 4th warmest since 1910. In Reigate our average September temp was 16.5C, not unexpected as we are in the warmer SE of the country. In 2013 the average for September was 14.4C but the range of temperature was greater: 2013 Tmax 30.9C and Tmin 4.6C were both more “extreme” than the respective Tmax 26.7C and Tmin 5.2C of 2014. Whilst the remainder of Autumn looks to be cooling down markedly now, 2014 remains on target to be an exceptionally warm year overall. Despite a cool August all the other months have been above average. The UK average rainfall for September 2014 was 19.4mm for the month, the driest since 1910. In Reigate we had 22mm of rain recorded (CoCoRahs) compared to over 47mm in 2013. The rainfall we got in Reigate this September was restricted to a few heavy thundery showers: many of these moved over London and missed us completely. However, a notable thunderstorm overnight on 19 Sept delivered some cracking thunder and lightning at about 1am and brought 10mm of rain in less than 20 minutes, and woke quite a few people up! Overall, however, the month was dry: 16 consecutive days of no rainfall at all came early in the month and mostly dry days with just odd showers characterised the rest of the month. Sunshine hours totalled 120 hours. Pictures below are a medley of photos from an “extreme” month due to the exceptionally dry conditions, the driest in 100 years in some places. September in Reigate. #Reigate last hurrah for “summer” warmth as Autumn arrives this weekend! September has retained some high daytime temperatures which are set to make it 1.4C or so above Central England Temperature (CET) long term average. New York city also experienced some warm Autumn days with 29C Tmax recently, followed closely by London with near 25C Tmax temps over the last weekend of September. 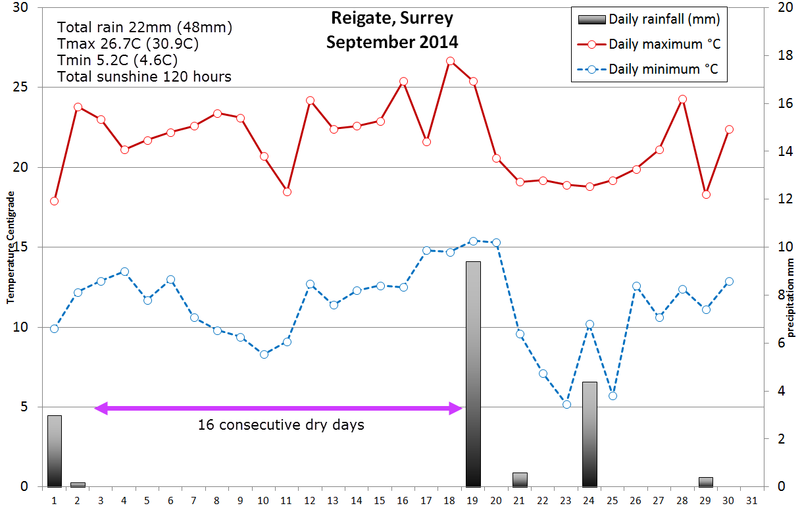 This month has also been exceptionally dry with Reigate recording just 20mm (tbc). The inevitable happens this coming weekend as Autumn arrives, albeit fashionably late. The chart below shows upper air temps dipping as cooler polar air arrives from 5 October (note upper air temps are 1500m, so don’t panic about the scale!). The charts below also show a defined change for Reigate and the SE over the first weekend in October and into Monday as high pressure and largely rain-free warm settled conditions this week give way to LOW pressure, frontal rain bands and cooler breezy-er conditions delivered by a lively jetstream from the Atlantic. The Icelandic LOW mentioned in previous posts will, at last, nibble through the anticylcone sat over the UK for so long. It may not be quite curtains for HIGH pressure and warmth for the SE yet and some recovery is hinted at later, but it looks like the persistent dry and settled conditions will push off this weekend and be replaced by more mobile Atlantic action. For Reigate, the change afoot starts gradually, with the odd light shower possible Wednesday, Thursday seeing a rise in pressure again and a continuation of warm and dry calm conditions to end the week. However, a glance to the north west will show an active cold front descending SE during Friday and arriving over SE and Reigate during Saturday morning. It is likely to push through by afternoon and leave brighter fresher conditions through Sunday, which looks not a bad day at all for Reigate, albeit cooler. The jetstream chart for Thursday and next Monday shows a significant shift south directly over the UK. This is forecast to enhance the trough over Scotland and dig it deeper into the south of the UK during early next week. Breezy conditions are likely into early next week with Monday having possible country-wide rainfall, especially heavy in the south as the warm air lingers CLOSE by to the south and interacts unfavourably with the colder air mass that could produce a lot of rain. The upper air charts below show how close the warm air lingers to the south of the UK. Monday… nasty in the south? 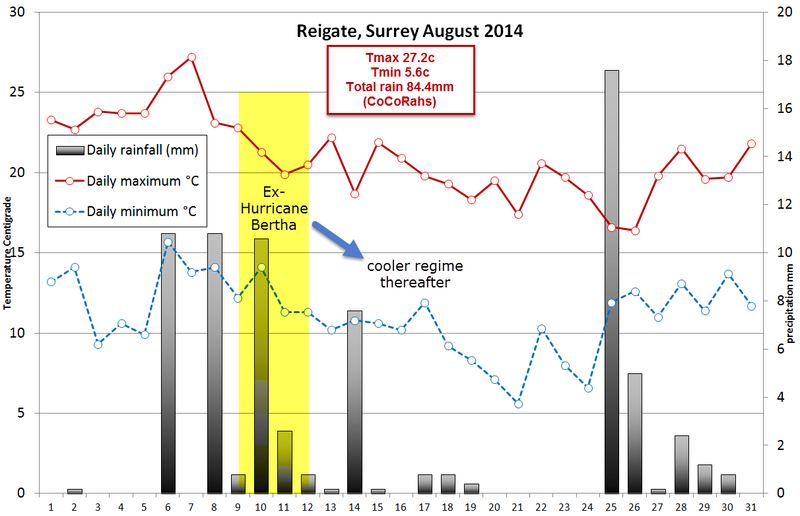 August 2014 weather stats for Reigate, Surrey. GLOBALLY, August 2014 was the warmest on record (NASA, see below). In contrast, August 2014 for the UK was the COOLEST August for 21 years since 1993 and rainfall was 156% above long term average in some places, including parts of the SE. 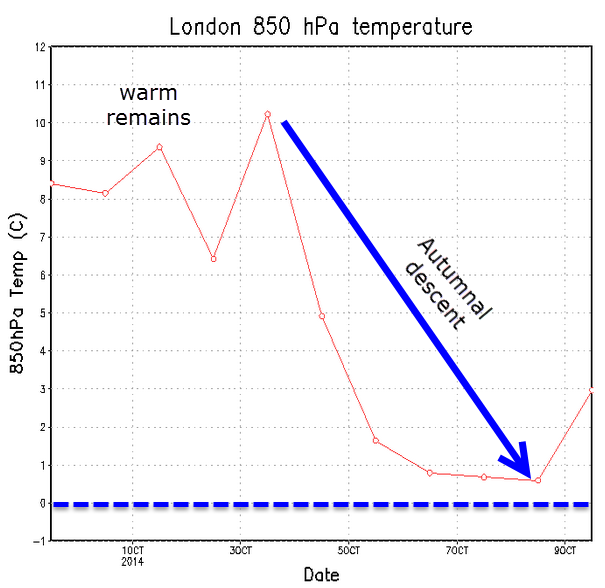 In Reigate the average temp was 16C compared to 17.4c in 2013. It was also wetter than usual, for example, twice as much rain fell Aug 2014 than in Aug 2013. This ended a run of much warmer than average months throughout 2014. The CET (Central England Temperature) is still seeing 2014 as one of the all-time warmest years even with a cooler August. Arguably Ex-Hurricane Bertha “destroyed” the balmy UK summer of 2014. She emerged out of the Tropical Atlantic early in the month and took aim at the UK. Despite weakening extra-tropical storm Bertha still dragged some cool polar air into the UK and Europe behind her. Bertha brought little direct disruption to Reigate and the SE but an impressive squall line moved across our region during the 10 Aug. There was no especially extreme weather associated with the squall line (regrettably for weather folk!) but the cloud-scapes were magnificent as the squall moved away further to the East. Bertha did bring some unseasonably gusty weather and 36mph was recorded at our weather station on 11 August. Winds in excess of 40mph were recorded locally higher up. Interestingly, NASA have just recorded August 2014 globally as the warmest ever August on record. This shows how discrete locations on a regional scale can buck the global trend… obviously some places have warmer and colder weather than the global average and some of these anomalies could be potentially record breaking despite being the opposite extreme of the global mean.